After her SuperBetter recovery, McGonigal had an October medical emergency. (Her nerve-wracked tweets read like dying words - "At emergency room being treated for suspected allergic reaction don't know 2 what may get epinephrine iv in a minute love you everyone.") Following six weeks of bed rest, she received a crosswalk bruising from a careless bicyclist. But in February 2010, the unlucky streak finally broke. "Gaming Can Make a Better World," McGonigal's talk at the prestigious TED conference in Long Beach, California, commenced by stunning the audience. The three billion hours we spend weekly playing MMOGs, she said, is "not nearly enough gameplay to solve the world's most urgent problems." (She recommends 21 billion hours.) People laughed. But then she outlined gamer virtues like urgent optimism, blissful productivity and the desire for epic meaning. "We can make any future we can imagine, and we can play any games we want," she concluded. "So, I say let the world-changing games begin." They applauded. They stood up and applauded. The media coverage was lavish. The following week she got interviewed on CNN to promote her newest project, Urgent EVOKE. The escalating scale of McGonigal's ambitions has made her recent games increasingly hard to categorize. The Lost Ring merged ARG and "big game." Urgent EVOKE is - well - first, try to picture 18,000 African schoolkids as World of Warcraft paladins, then imagine Jane McGonigal standing under a big exclamation point. The EVOKE team assigns general missions ("Help invent the future of money," "Help empower women," "Develop your resilience superpowers - and prepare for the volatile future of urban life"). Players research the topic, then ideally "do something small to help solve a real problem" and (in a blog post or image) "tell a story about the future you want to make." They earn in-game honors and can win a trip to the Evoke Summit in Washington DC. Ten players receive online mentoring from "an experienced social innovator." EVOKE aims to foster what Superstruct scenario designer Jamais Cascio calls "Super-Empowered Hopeful Individuals." You might call EVOKE an "activist game" - but its sponsor, the World Bank, is no one's idea of an activist. The Bank's shadowy pall prompted an arch parody, Urgent Invoke: "To play, post a comment explaining your Nobel-Prize-winning idea for how the World Bank can successfully whitewash its international public image." This highlights the criticism occasionally leveled at McGonigal: her sometimes dodgy sponsors. The Lost Ring, which promoted physical fitness, was "discreetly" co-sponsored by McDonald's, a fact buried in the site's Terms of Service. (The other sponsor, marketing agency AKQA, said The Lost Ring "engaged younger audiences who dislike overt marketing.") It probably doesn't help that for three years McGonigal has been a research director at the Institute for the Future, a Palo Alto think tank spun off from a featured player in every conspiracy theory since the 1960s, the RAND Corporation. This is niggling stuff, though, and McGonigal doesn't appear concerned. It's likely she could soon fund her projects herself, if she likes - whether through a MacArthur fellowship "genius grant" or from the sales of her forthcoming Penguin Books title, Reality is Broken. 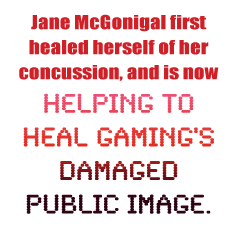 By finding (1) satisfying work that (2) she is good at while simultaneously enjoying (3) amiable company and (4) working toward a larger goal, Jane McGonigal first healed herself of her concussion, and is now helping to heal gaming's damaged public image. Amid dialogues dominated by game addiction and "sociopathic games" like FarmVille, McGonigal champions the polar opposite of addiction and exploitation: the epic win. She is rapidly becoming gaming's most prominent and respected advocate. For CNN and TED, and maybe even the Nobel Prize committee, our field could not hope for a better face.